Posts have been a little few and far between over the last few weeks, but don’t worry I haven’t stopped eating Thai food I’ve just been busy with an intensive Thai language course, but more on that later. We decided recently that we needed to try more Thai sweets because there is more to Thai sweets/desserts than Mango Sticky Rice (We do find it hard to pass by though). So on that note whilst walking from Pra Khanong BTS the other week I came across a stall selling these interesting looking sweets. 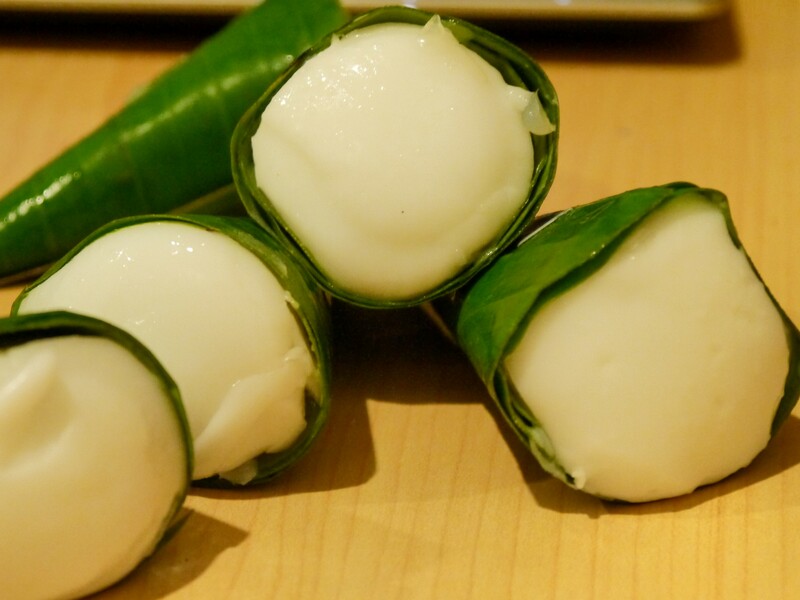 They are known in Thai as Takoh and are a coconut cream jelly. This particular version was multi layered, the top as you can see in the above photo was salted coconut cream jelly and below that was a sweet corn flavored clear jelly. Initially I ate a mouthful of the coconut cream jelly by itself and thought it was too salty but when I discovered the sweet corn layer underneath and had the two together it was a perfect balance of sweet and savory and was delicious. I’m looking forward to trying more Thai sweets/dessert – next on my list is the custard filled pumpkin.